To enhance our appreciation of The Ring (Der Ring des Nibelungen), Ken Hoover has written the following essay. A clear and solid foundation for examining Richard Wagner’s operatic phenomenon The Ring of the Nibelung is to consider it as a miracle: an amazing product or achievement, an outstanding example of something above and beyond the ordinary. The very fact that The Ring even exists and is performed as frequently as it is nothing short of a miracle­—or even a series or cluster of miracles—mostly from the mind of a man who was sadly flawed as a human being, but also an exceptional creative genius in the realms of music and drama. It is unlikely that any other composer in all of music history had the commitment, the determination, and the incomparable conscious and unconscious inspiration to spend almost half of his creative life on this one massive, incredible work. The unseemly megalomania for which Wagner is often criticized is the very source of the creativity needed to complete such a miraculous undertaking. The fascinating creation of The Ring is the very stuff of miracles—something “above and beyond the ordinary.” Wagner’s interest in Germanic and Nordic mythology as subject material for an opera may have begun as early as 1843 when he was appointed Royal Kapellmeister (Saxon court conductor) and began delving into the vast resources at the royal library in Dresden. He devoted himself to reading Greek drama and mythology, philosophy, translations of Icelandic Edda, Nibelung myth, the Grimm brothers’ collections of fairy tales, and more. He also began to accumulate an extensive personal collection of resources and classical books. 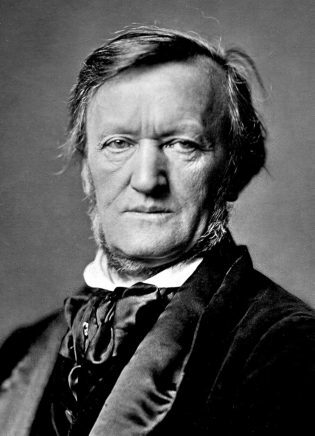 After completing Lohengrin in 1848, Wagner entered a five-year period during which he wrote no music of significance. Instead, he engaged in deep study and in writing articles mainly on music and politics. This time was one of intense nationalism throughout Europe, and there was a great deal of effort to find an art form that would unite the various Germanic states into a unified nation with a strong sense of identity. A series of articles in the Neue Zeitschrift für Musik, inviting composers to write a “national opera” based on the Nibelungenlied, a 12th-century High German poem that, since its rediscovery in 1755, had been hailed by the German Romantics as the “German national epic.” This topic undoubtedly captured Wagner’s attention. The now-forgotten German composer Heinrich Dorn wrote an opera based on the Nibelungen epic, and Felix and Fanny Mendelssohn corresponded on such a project. Others also may have made similar efforts. Wagner’s interest in the project took hold. In 1848 he completed the first prose sketch of “The Nibelungen-Myth as Sketch for a Drama.” As he began working on the poem (the libretto) for Siegfried’s Death (Siegfrieds Tod, which became Götterdämmerung), he saw the need for more detail and clarification of the role of the heroic Siegfried. Working backward, he framed the story of Siegfried’s youth (Siegfried) and heroics. The story of Siegfried’s parentage and the family history of the Wälsungs became Die Walküre (The Valkyrie). In addition to Siegfried’s background, Wagner wanted to show, not tell of, one more thing—the story in which the ring of power was forged from the Rhinegold by the Nibelung dwarf, Alberich. Still another opera was thus needed: Das Rheingold (The Rhinegold). After more changes and alterations, Wagner settled on three operas and a fore-evening modeled on the form of Greek drama. The complete Ring Cycle includes Das Rheingold, Die Walküre, Siegfried, and Götterdämmerung. Wagner labeled the work Der Ring des Nibelungen, A Festival-Stage-Play to be Produced on Three Days and a Fore-Evening. The concept was a perfect fit with the artistic ideals of Greek tragedy with which Wagner had been fascinated for some time. It was a miracle that the time, place, and circumstances came together at the peak of Richard Wagner’s creative potential. The Ring had been conceived, and its long, long germination process had begun. The titles of the four operas provide us with a clear outline of the dramatic flow of the story. The Ring of the Nibelung tells us about a ring of great power and its effect on the lives and fortunes of both gods and mortals. Das Rheingold tells how Alberich, a Nibelung dwarf, stole the gold from the Rhinemaidens and made it into a ring that gave its wearer the power to rule the world. The god Wotan steals Alberich’s ring, tarnhelm (which can alter appearance), and gold to pay the giants for building Valhalla, his newly constructed castle, thus freeing his sister-in-law, Freia, from the giants. Possessing the ring, however, triggers in Wotan a hunger for power and world dominion, as foreshadowed by Alberich’s curse. On the stern warning of Erda, the earth goddess, Wotan gives up the ring to the giants. The next possessor of the ring, the giant Fafner, consumed with greed and lust for power, kills his brother, Fasolt, taking the spoils to the deep forest while the gods enter Valhalla to some of the most glorious and ironically triumphant music imaginable. Die Walküre dramatizes the love of twin Wälsung siblings, Siegmund and Sieglinde, as well as turmoil in the family of the gods. Wotan has intended Siegmund to find the sword left for him and to regain possession of the ring. When Fricka sees through this illusion of free will, Wotan must agree to forbid Brünnhilde, the eponymous Valkyrie, from fighting for Siegmund. Siegmund is killed in battle, but not before he impregnates Sieglinde with a male child, Siegfried, the hero of the next opera. As Wotan’s soul, his “wunschmaid,” Brünnhilde disobeyed his spoken order, but not his true wishes; Wotan admits that he would have done as she did had he had the freedom to do so. Wotan takes away Brünnhilde’s godhood, puts her to sleep on a mountain rock, and at her request surrounds her with magic fire so that only a fearless hero can break through it. The end of the opera is absolutely miraculous! In this sublime ending, Brünnhilde separates from Wotan, using her own will to serve human love, and Wotan sees the beginning of the end of his power. Siegfried tells the story of the coming of age of the son of Siegmund and Sieglinde. Siegfried uses his heroic strength to re-forge his father’s sword, which had been broken in Die Walküre. He grills his deceitful guardian, Mime, in search of his heritage and identity. He kills a dragon and carries off only the ring and the tarnhelm from the dragon’s huge treasure trove. Realizing that something is still missing, he follows a forest bird up the mountain and finds what he presumes to be a sleeping knight surrounded by fire. Removing the breastplate, Siegfried discovers that the sleeping figure is not a man at all, but Brünnhilde. Siegfried at once discovers both fear and love. When he awakens her, Brünnhilde recognizes Siegfried as the hero for whom she had hoped. Their opera-ending duet is happy and hopeful, and Siegfried gives Brünnhilde the ring as a token of his love. In Götterdämmerung, Siegfried travels down the Rhine, where the Gibichung brother and sister await him, directed by their half-brother Hagen, son of Alberich. Hagen plots to have Siegfried drink a potion to make him forget Brünnhilde and become infatuated with Gutrune; he is also to disguise himself, using the tarnhelm, and bring Brünnhilde to marry Gunther. Hagen plans to retrieve the ring for himself and Alberich. Furious at Siegfried’s betrayal, Brünnhilde plots with Gunther and Hagen to kill him. After the murder, Siegfried’s funeral procession is heroic and sublime. Even in death, Siegfried spurns Hagen’s attempt to take the ring. Brünnhilde rides her horse onto Siegfried’s funeral pyre as Valhalla catches on fire. As Valhalla burns, we can see through the fire and smoke as Brünnhilde returns the ring to the Rhinemaidens from whom it was stolen in the beginning. Leitmotifs recalling, among others, Siegfried’s heroism, the cleansing fire and water, Wotan’s farewell to Brünnhilde, fate, and redemption combine in a miraculous ending of one world order and possibly the beginning of another. So what does all this mean? Is the world fated for destruction by those in every sect and tribe who are hungry for power? Does it mean that the only way forward is by destruction of the old and the return to respect for nature? Although Wagner tried several times to put the point of The Ring into Brünnhilde’s mouth, he was never satisfied. He finally ended the opera with no clarifying speech. “Listen to the music,” he said, “and all will be clear.” Essentially it is up to each of us to interpret the meaning of this miraculous work. In December 1852 the libretto for this massive work was ready for the composition of the music. The Ring contains elements from a vast trove of resource material from Nordic mythology and German philosophy as well as many unique features that emerged from Wagner’s imaginative literary mind. The tale had been created from end to beginning, and now the music would be composed from beginning to end. Wagner’s mind must have been overflowing with themes, leitmotifs, and harmonic adventures even as he wrote out the poems. The sonic world Wagner created for The Ring was absolutely new, and was surely exerting itself in some form even as he framed the libretto. One of the most striking elements of the music in The Ring is the use of leitmotifs. Wagner used these thematic snippets, not just as simple “signature tunes” but in a creative variety of ways: altered keys, minor or major, upside down, backward, mixed together, and more. The orchestra plays a more active role than ever before in opera, operating much like the chorus in Greek drama. The composition of the music of The Ring was interrupted after the second act of Siegfried for 12 years while Wagner composed Tristan und Isolde and Die Meistersinger von Nürnberg. Despite the hiatus, the music retains its consistency and continuity in unbroken development. This ability to return to the operas with no decline in creativity and perhaps even deeper artistry is certainly another miracle. Personal as well as musical distractions could have interfered with or even destroyed The Ring. Wagner experienced terrible conflict with his wife Minna, infatuation with Mathilde Wesendonck (wife of a generous benefactor), banishment from his homeland, obsession with the philosophy of Schopenhauer, and constant financial struggles. Given all that was going on in Wagner’s life, it is amazing that The Ring survived to completion. But the miracle of all miracles happened on May 3, 1864. The emissary of the new King of Bavaria, Ludwig II, finally caught up with Wagner, convincing him that he was not a bill collector. Ludwig was the fan of which every struggling musician dreams; he had virtually limitless resources. The funding was assured for a Festspeilhaus in Bayreuth and for a festival consisting of three cycles of the four operas of The Ring. Alas, they would not be free for the eager German population, as Wagner had unrealistically wished, but the Wagner Festival in Bayreuth did indeed come to fruition. Ludwig’s gifts to Wagner to pay off his debts, to support his lavish lifestyle, and mostly to support his extravagant and idealistic plans for the production of The Ring did not bankrupt the state of Bavaria. The sum total that was spent on all of Ludwig’s grants to Wagner was less than one-third of what Ludwig had spent on the bridal carriage for his wedding, which never took place. Moreover, Wagner was no self-indulgent fop, lying back to be waited upon. He worked hard on his compositions. He went on exhausting concert tours, often conducting excerpts from his own works, to raise money for the Bayreuth Festspeilhaus. Ludwig’s intense love of Wagner’s music assured the miracle of The Ring. I do not know how the people of Bavaria view this page of their history, but for music lovers it was a worthy investment. The final score of The Ring was completed in November 1874. It had begun as a treatise spelling out the evils of the industrial revolution and unchecked capitalism: greed, injustice, and mistreatment of the poor. It ended as an insightful exploration of human nature, with multiple layers of interpretation. It contains observations that would not be fully recognized for fifty years or more. The music was novel at the time and still dazzles the ears. It is a miracle that delivers new insights and awareness on every hearing. Although Wagner experienced many periods of self-doubt and despair over the completion and performance of The Ring, he pressed on to appease the creative force that was undeniable, giving us this great treasure. In the last sentence of his book Wagner: The Terrible Man and His Truthful Art, (1995), Father M. Owen Lee points out that “The intuitive Wagner saw deeper into human nature than the rest of us are likely to do. And so we need him, [flawed though he may be] with the God-given power to see unerringly into ourselves and so to help us with our lives.” And that is the essence of the miracle of Richard Wagner. The tragedy is that he was unable to do this for himself. There are many who just can’t get enough of The Ring. I met my first Ringheads at the restaurant on the grounds of the Festspeilhaus in Bayreuth. They had first met at a Metropolitan Opera Ring production in New York City and had traveled together to some six Ring productions from Seattle to Sidney since then. Some of my friends have seen far more than these. What a life! The ultimate miracle of The Ring is the experience of seeing and/or hearing it. My first encounter with The Ring was the Texaco Metropolitan Opera broadcast of 1952. I was seventeen years old and I still have vivid images of scenes, characters, and events that Wagner’s music painted for me and Milton Cross’s revealing synopses of each act further provoked. The music seemed a part of me that had always been there and had just then been awakened. It stirred feelings of wonder and longing. It left me at a whole new level of self-awareness, and has for all the years that have followed given me pleasures and insights that have enriched my life. May we all have joyous opportunities to gather beside the Rhine and be refreshed and renewed by the glorious miracles of The Ring. Lee, M. Owen. 1990. Wagner’s Ring: Turning the Sky Around. New York: Summit Books. Lee, M. Owen. 1995. Wagner: The Terrible Man and His Truthful Art. Toronto: University of Toronto Press. May, Thomas. 2004. Decoding Wagner: An Invitation to His World of Music Drama. Pompton Plains, NJ: Amadeus Press. Saturday, March 30, 2019, The Metropolitan Opera Live in HD series will feature Die Walküre. There will be an encore showing on the following Wednesday. Check your local theater schedules. The Metropolitan Opera will offer three Ring Cycles in the spring of 2019.